"This is a very moist and light carrot muffin. 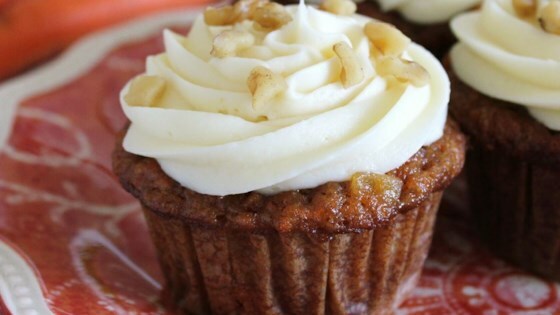 It's not too sweet and not greasy like other carrot muffins/cakes. The White Chocolate Cream Cheese Icing adds just enough sweetness to round it off." In a bowl, beat together the cream cheese and butter until smooth. Mix in white chocolate, 1 teaspoon vanilla, and orange extract. Gradually beat in the confectioners' sugar until the mixture is fluffy. Mix in heavy cream. Moist carrot cupcakes with a cream cheese and white chocolate frosting. These were exactly like my grandma's carrot cake she used to make. I changed it up a bit...1/2 apple sauce for 1/2 the oil, whole wheat flour, brown sugar for white. Super moist and tasty. I only tried making the icing and it was the best tasting I've ever made. Delicious ! !